In a league where teams play at even strength about two-thirds of the game and where power play opportunities in the playoffs dry up faster than a raisin in the sun, especially in deciding games, how wise is it to have an over-reliance on the power play and goaltending to save your bacon? 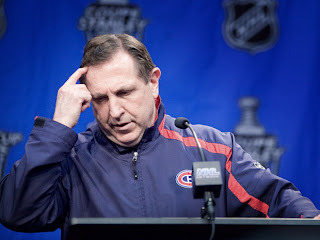 Passive, counter-strike hockey is Jacques Martin’s coaching style and it simply doesn’t work. At least, it’s not what Stanley Cup winning teams do but for the past two seasons, the Montreal Canadiens have been ranked the 6th most dependent on their power play to generate offense. If you’re going to lean on the power play, and playoff history suggests you shouldn’t, it doesn’t help to play a passive system that doesn’t require teams to take a lot of penalties. On the surface, the stats look somewhat decent. Last season, the Habs were 17th at home and 13th on the road in power play opportunities for an overall rank of 16. The year before, the Habs were 26th at home and 29th on the road for an overall rank of 30. Not great but apparent signs of progress, right? Not exactly. A team that leans on their power play as much as Montreal does should aim to have their power play on the ice more often than their penalty kill unit. Sounds logical and in the NHL today, more than 75% of teams get a surplus of power play minutes on home ice. The Habs? They were ranked 28th in power play surplus at home, 22nd the year before and have been dead last in the NHL on the road, two years running. Add it all in and it’s even worse. The Montreal Canadiens have been the worst in the league generating a surplus of PP minutes ever since Jacques Martin took over. In fact, they’ve never been ranked 30th in any season since the NHL started tracking those stats in 2002-03, let alone two consecutive seasons. How wise is it to lean on a power play that’s on the ice a minute less than the PK unit? Not very. Once the playoffs start? Yeah, you get the idea. Little bothers me more than people trumpeting PP or PK percentage rankings. As we’ve seen, there’s a lot more going on underneath and I’m a big believer in context. Special Teams differential helps provide that context. The formula is straight forward: (power play goals scored – short handed goals against) – (power play goals against – short handed goals scored). Since special teams are on the ice for a third of the game on average, less so in deciding playoff games, it’s easy to over-state the importance of special teams. It matters, but it’s usually not the deciding factor unless you have an unhealthy dependence on it to win hockey games. Last season, only 2 teams made the playoffs with a negative Special Teams differential, one in each conference. Buffalo in the East and Phoenix in the West. Montreal was +5, just above the average of +4.6 goals among playoff teams in the conference. The average differential among the Western playoff teams was +8.3. While the Habs had the 4th best PK percentage, they were 11th in the East in PK goal differential. A direct result of being an NHL worst in PP surplus minutes which cut into their 2nd in the East ranking on PP goal differential. For a team that depends on special teams and the power play in particular, the Montreal Canadiens have been merely average overall. The reasons are quite simple: A system that doesn’t draw many penalties and a lack of discipline from the top down that puts the power play into negative minutes. Meat and potatoes time. Or perhaps with some Yorkshire pudding. This is where Stanley Cup winners are born. Two-thirds of games are played 5on5, 4on4 or 3on3, even more so in deciding playoff games. Win the even strength battle, win the war and size the rings. When I wrote a story that compared Jacques Martin’s coaching style to the last 10 Stanley Cup winners, I was surprised to discover power play and penalty kill percentage rankings were among the least important strategic aspects of the game for Cup winners. For Martin, defence and special teams are historically more important but that ultimately doesn’t win Championships. While good defence is mandatory, Even Strength differential ultimately decides who wins the Stanley Cup, not Special Teams differential when opportunities are limited in the playoffs and where teams are up against better defenses in the later rounds. Boston won the Stanley Cup, in large part because their Even Strength differential was an NHL leading +47. Vancouver was 2nd in the league at +40 but had a far superior Special Teams differential; +31 versus +3. Shut down or limit power play opportunities and try to win the battle at even strength and with just 3 penalties called in Game 7, a large part of the Vancouver advantage was negated. Looking back at the last 10 Cup winners, the average Even Strength differential was +31. In stark contrast, the Habs under Martin were just +6 last year. Only Tampa made the playoffs in the East with a lower ES goal differential, in large part due to the lightning having the worst goalie tandem in hockey until the trade for Roloson. After the trade, Tampa’s ES scoring improved significantly. The year before, the Canadiens ES differential was a -8 as they squeezed into the last playoff spot. Among the playoff teams in the East, only Ottawa was worse and they were knocked out in the first round. Yes the Habs went far, but against better defenses and with fewer power play opportunities in the deeper rounds, the lack of even strength scoring eventually caught up with them. As for this season, we’ll likely know where the Habs are headed by November 1st. The offense and the power play in particular were slow to get on track last year as well but Carey Price held the fort for the first 20 games, posting a 2.00 GAA and a .932 SA% which was the only reason the Habs started out 12-6-1. Clearly repeatable stats, right? As Elliotte Friedman pointed out recently, only 2 of 29 teams, Buffalo in 2010 (7th) and Calgary in 2006 (8th) have made the playoffs in the post-lockout era after being 4+ points out of a playoff spot on November 1st. In a world of 3 point games, just 7% made it back from an early, significant slump. Needless to say, with Martin trying to squeeze offense from a defensive stone and banking on the power play to save his bacon, if Price is merely good this time round, it could get ugly with as many as 71 games still to play.